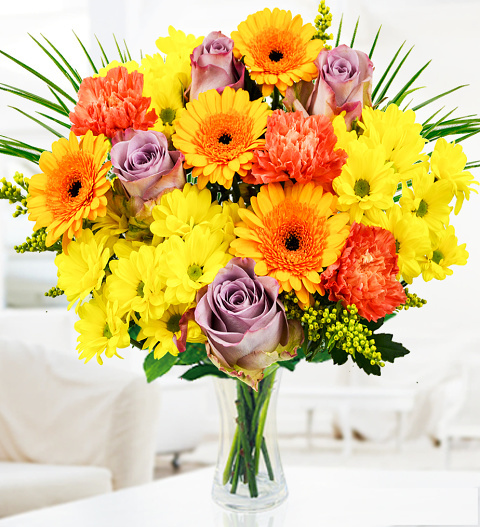 This gorgeous bouquet makes the perfect gift for any occasion. From birthdays and congratulations to the arrival of a beautiful new baby, this bunch always brings joy and happiness. Our team of professional florists have selected nothing less than the finest Memory Lane Roses, germinis, cerise carnations, chrysanthemums, and solidago for this stunning floral display. Framed with robellini palm for the perfect presentation and available for UK next day delivery, all you need concern yourself with is writing the perfect message. Chocolates may contain nuts.